When Clopton and Bowling Green advanced to the championship of the Bowling Green Tournament, everyone expected a classic title game…the two sides didn’t disappoint. The championship came down to a run, a final shot and a repeat champion as the Hawks downed the Lady Cats 52-51. In front of a packed house, the teams took the floor on Friday with the Hawks looking to avenge an early season loss to the Lady Cats. Despite being without leading scorer Jillian Lockard, the Lady Hawks started fast. Clopton drained three from beyond the three point line to build a 15-9 lead after the first quarter. Calynn Lockard scored 10 points in the quarter to lead the Hawks’ attack. Eight points from Caitlin Bilhartz provided the answer for Bowling Green in the second quarter with freshman Brylie Sparks and senior Gabi Deters adding three points each to pull the Lady Cats ahead by halftime, 23-22. The lead went back and forth in the third quarter as Megan Harrelson went to work for Clopton, scoring seven points in the quarter and Kinley Charlton notched five for Bowling Green. The teams went to the final quarter with Clopton ahead 39-36. The Lady Hawks were just 2-12 from the free throw line and missed their first shot from the line in the fourth as the lead continued to change hands. The game remained close late and with a minute and 15 seconds left Deters hit two free throws to pull the Lady Cats within a point of the Hawks. The second free throw was the 1,000th career point for Deters and the game was stopped to recognize the senior’s accomplishment. The Hawks missed the front of a one and one free throw opportunity on the other end of the floor and Deters grabbed the rebound for Bowling Green. Deters was fouled again and once again hit both free throws for a 49-48 lead. Clopton took a timeout with 21 seconds remaining. As play resumed Deters fouled Kaitlyn Kuntz, sending the Clopton senior to the line with an opportunity to put the Hawks ahead. Kuntz was 1-4 from the line as she stepped in for two shots. She sent the first shot off the backboard and in to tie the score and drained the second for a one point Hawk lead, 50-49. Bowling Green returned from a timeout with 12 seconds to go and got the ball to Bilhartz who almost got the lead as she was fouled, but her shot bounced out. Her free throws missed, but Deters was fouled on the rebound with a second chance to put the Lady Cats ahead. The foul was charged to Calynn Lockard, her fifth and final, to send her to the bench. Deters hit her seventh straight free throw in the quarter and Bowling Green went ahead 50-49 with 6.2 seconds left in the game and the Lady Hawks without a timeout to draw up a play. Clopton got the ball under the basket and Caragan Lockard gave Kuntz a short pass in the corner who sped down the sideline into the offensive end, cut and fed Taylor Akers in the final second. Akers, already with eight points in the championship, stepped inside the three point line and threw the ball toward the net as the horn sounded to end the game. The shot bounced as the crowd held their breath, then found its way through the cylinder to win the Championship for the Lady Hawks. The Clopton student section rushed the court to celebrate the win and Akers was named the Tournament MVP for her 10 points and heroic shot. She also earned the Community State Bank TribCast Player of the Game. 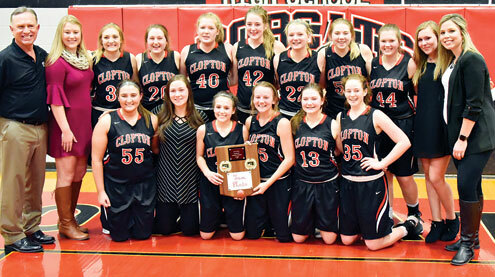 Scoring for Clopton: Kuntz, 16; Harrelson, 13; Calynn Lockard, 12; Akers, 10; Caragan Lockard, 1. Scoring for Bowling Green: Deters, 23; Bilhartz, 14; Charlton, 9; Sparks, 3; Madeline Norton, 2. In addition to Akers, also making the All-Tournament team were Gabi Deters and Kaitlyn Kuntz. Coach Deaven Streed noted it was a great tournament for the Lady Hawks overall as they were without Jillian Lockard who is injured. Streed pointed out that even though there were several lead changes, her girls stayed the course and rallied. Streed noted that she’s always impressed by how the bench always rallies behind the girls on the floor. Coach Craig Smith also noted the atmosphere on Friday was outstanding. Smith offered congratulations to Deters for netting her 1,00th career point and earning a spot on the All-Tournament team that was selected by local media. He noted that accomplishing that in that environment is very special. He also noted the bench was loud and proud in support of the girls on the floor. Smith said that team got into some precarious situations in the game but always battled back. The Lady Cats returned to action on Monday against Silex. The Lady Hawks will take on Louisiana tonight (Tuesday, Jan. 29). All 21 games of this year’s Bowling Green Tournament were featured on TribCast and can be found in the archive online anytime at www.thepeoplestribune.com. Also find more photo highlights on the Trib’s Facebook page. 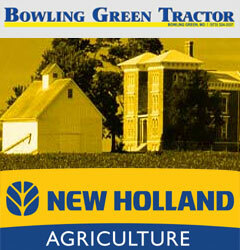 Find more on the Clopton and Bowling Green semifinal games on page 11.